Canada's Prime Minister Justin Trudeau made an unscheduled appearance in Vancouver on Friday night - jogging through a high school prom photo. The keen sportsman had been out for a run along the Stanley Park Seawall when he passed a group of students in full formalwear. 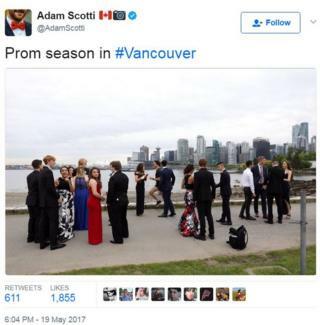 His official photographer Adam Scotti tweeted a picture of the moment, captioned: "Prom season in #Vancouver". But one delighted student told Canada's CBC the group had spied him in shorts and t-shirt, and begged him to join their photo-shoot. "We were just taking photos and hanging around talking, and then Trudeau, he just comes running," Constantine Maragos said. "We were stoked," Mr Maragos confirmed. The same month, a Canadian family stumbled on him emerging from a cave while hiking in Quebec's Gatineau Park. "When you step out your front door, you never know what adventures await," his father Jim Godby noted later on Facebook. Image caption Canadian Prime Minister Justin Trudeau took a selfie with 13-year-old Alexander Godby.